Suzuki Motor Corporation is to lease its MIO fuel-cell mobility scooter to the Shizuoka prefectural government for a collaborative trial from 28 November. 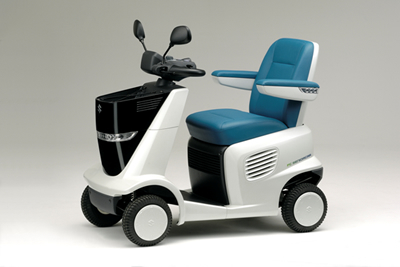 Suzuki showed the MIO as a reference exhibit at the Tokyo Motor Show in 2007 and at the International Home Care and Rehabilitation Exhibition in 2006 and 2007. It has improved the MIO’s reliability ahead of the trial with the prefectural government. Whereas mobility scooters already launched by Suzuki are powered by batteries, the MIO is powered by a fuel cell, which uses a convenient liquid fuel (methanol). The fuel cell gives the MIO a range of 60km, which is about twice that of a battery-powered mobility scooter. Suzuki is conducting development with a view to putting fuel-cell technology to practical use in mobility scooters for seniors. Suzuki will also include the already-launched battery-powered ET4D mobility scooter in the forthcoming trial as a way to better ascertain the advantages and disadvantages of fuel-cell models. It plans to use the resulting know-how to further improve the MIO’s fuel-cell technology.